Human Ear Anatomy and Physiology is our today’s topics. Human Ear is one of the essential part of our Head. The ears are paired sensory organ comprising the Auditory system involved in the detection of sound and Vestibular system involved with the maintaining of body balance. Human Ear Anatomy and Physiology is the topic that I am going to discuss in this Post. The ear is divided anatomically and clinically into 3 parts- The External ear, Internal ear and Middle ear. A cartilaginous portion:- In its outer third which is directed medially and slightly upwards and backwads. The cartilage, deficient superiorly, is continuous with that of the auricle. The deficiency is continuous with the space between the tragus and the crus of the helix. The skin is vibrissae bearing and produces wax from pilosebaceous and ceruminous glands which binds with desquamated keratin. A bony portion:- In its inner two-thirds. The posterosuperior portion is formed by the squama, the remaider by the tympanic palate. The thin hairless and gland-free skin is closely adherent to the sutures between the tympanic palate and squama. Prominent anterior and posterior bony meatal spines may project from the free outer border of the tympanic palate at the squamotympanic and tympanomastoid sutures.These endomeatal sutures and spines add to the difficulty of seperating intact flap of skin from the bony canal. Mastoid antrum, posteromedial and superomedial to the sloping squamous portion of the deep bony canal. Auriculotemporal branch of superficial temporal artery, anteriorly. Branches of postauricular division of external carotid artery, posteriorly. By the branches of 5th, 9th and 10th Cranial nerve. The medial surface of auricle is supplied by Great auricular and lesser occipital nerve. External jugular lymph nodes, below. There are two constrictions in the external auditory canal. At the medial end of the cartilaginous portion. About 5 mm from the tympanic membrane. The lower orifice lies in the lateral wall of the nasopharynx on a level with the posterior end of the inferior turbinate. In the adult this 3.7 cm tube runs laterally and posterosuperiorly, to open in the anterior wall of the tympanic cavity. The lateral third is bony While the lower superior and medial parts are cartilaginous & the remainder membranous. The tube is closed at rest, but is opened on yawning or swallowing by the combined action of the sphincter of the nasopharyngeal isthmus and the tensor palati muscle, which is attached to the cartilaginous medial wall of the tube. The tube is more horizontal and wider & shorter in Child. Mesotympanum- lying medial to the membrane. Epitympanum(attic)- lying medial to the bone of the horizontal part of the squama, above the membrane. Hypotympanum- below the drumhead, medial to the tympanic plate. Tympanic plexus of 9th Nerve. An outer epithelial layer, continuous with the epithelium of the external auditory canal. A middle fibrous layer, containing inner circular and outer radial fibres, and the handle of the malleus. The pars tensa is thickened peripherally into a fibrocartilaginous annulus, which fits into the grooved tympanic sulcus of the temporal bone. The fibrous layer is absent above the malleolar folds and this portion of the membrane is called the membrana flaccida. TM is set obliquely. It is convex towards the tympanic cavity. 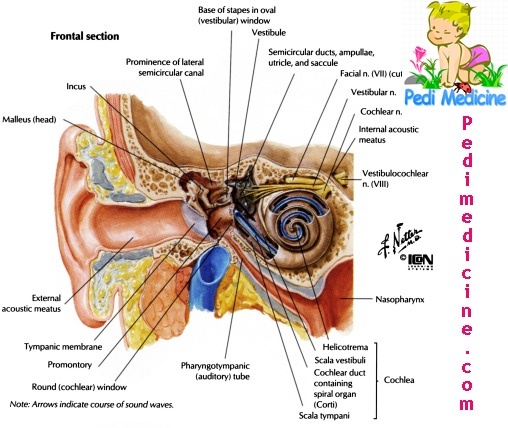 Transmit sound energy from the surface of the tympanic membrane to the oval window and thence to the cochlear fluids. These are the tiny bones in our body. A branch of facial, arises in the fallopian canal above the stylomastoid foramen. It enters the middle ear cavity through the posterior wall, lateral to the pyramid; thence it passes forwards, lateral to the incus and medial to the malleus, to escape from the cavity through the canal of Huguier & squamotympanic fissure. Leads posteriorly from the epitympanum to the mastoid antrum. The bony prominence of the horizontal semicircullar canal lies between its medial wall and floor. The tip of the short process of incus has a ligamentous attachment to its floor. Situated in the posterior portion of petrous temporal bone. Its anterior wall receives the posterior opening of aditus. Deep to the medial wall lie the posterior and horizontal semicircular canals. The roof which may be deficient, separates it from middle cranial fossa. Its lateral wall is the squama, and the suprameatal taingle forms its bony surface marking in the adult. This wall may be up to 15 mm thick in the adult. Postero inferiorly it communicates by several openings with the mastoid air cells. Although the mastoid air cells can vary considerably in size, number and distribution the antrum is always present. Superior petrosal and superior tympanic arteries and ramus nutrica incudomellei(middle meningeal artery) to the superior region. Inferior tympanic artery(ascending pharyngeal) to the inferior region. Anterior tympanic artery(internal maxillary artery) and ramus tympanici(internal carotid) to the anterior region. Posterior tympanic artery(post auricular) to the posterior region. Sensory:- From the 9th cranial nerve, through, the tympanic plexus, which receives a twig from the 7th nerve. *From the mandibular branch of the 5th cranial nerve to the tensor tympani muscle. *From the stapedial branch of the 7th cranial nerve, to the stapedius muscle. Saccule and utricle, in the bony vestibule. Membranous semicircular ducts, in the bony semicircular canals. Consists of a series of neuroepithelium structures arranged along the inner edge of the basilar membrane. A tunnel, composed of tho rows of rods of corti, and forming a triangle with the basilar membrane, divided the organ into inner and outer portions. On the inner side of the inner rod there is a single row of hair cells. These inner hair cells are bulbous in shape. The hairs of each cell consists of 120 stereocilia arranged in two rows in the form of a double V, with their apices directed away from the modiolus. On the outer side of the outer rod there are three or four rows of hair cells. These outer hair cells are columnar in shape, with 46-148 stereocilia arranged in three rows in the form of awide triple W, with their apices also directed away from the modiolus. The OHC cilia are 2 micro.m. long in the basal turn and increase in length to 6 micro m. at the apex. There are about 4500 IHCs and 12500 OHCs in each ear. The tectorial membrane overhangs the organ of Corti. Outside the outer hair cells are the cells of Hensen. Lining the outer side of the scala media is the stria vascularis which is important in regulating Na and K ions. Cochlear division of 8th nerve. The terminal fibres end in contact with the hair cells. These fibres are of two types: Type I fibres, sparsely granulated and probably afferent: and Type II fibres, richly granulated and probably efferent.The fibres pass in the spiral lamina to the spiral ganglion in the modiolus, to become the auditory branch of the VIII th cranial nerve.